Pendant measures approximately 1-7/8" long (including bail) and 1-3/8" at widest point. 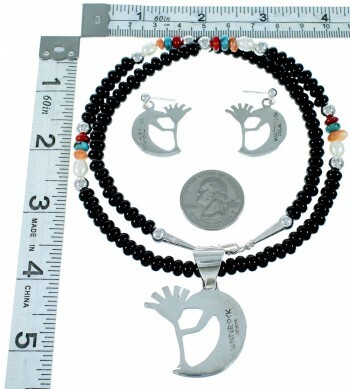 Matching post dangle earrings measure approximately 1-1/8" long and 1" at widest point. Necklace measures approximately 22-1/8" long. This set is a part of our exclusive WhiteRock collection, which is a stunning selection of excellently designed jewelry. 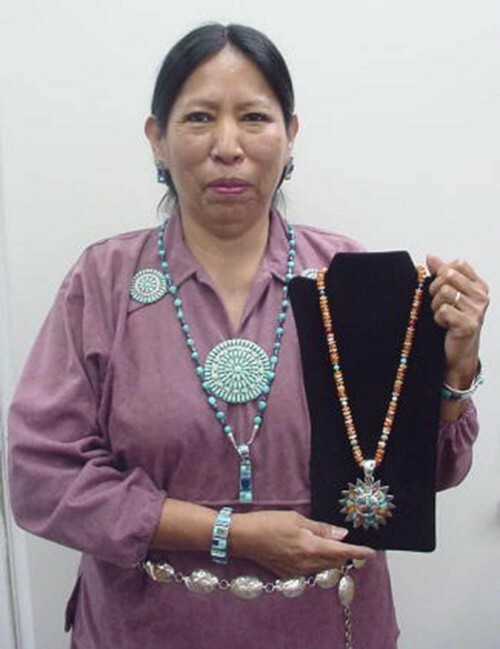 The jewelry is hand crafted out of genuine sterling silver and multicolor inlay using some of the best silversmiths and inlayers in the world. The stones used in every piece create some of the most incredible color combinations. Each is hand selected and is of the highest and best quality anywhere. 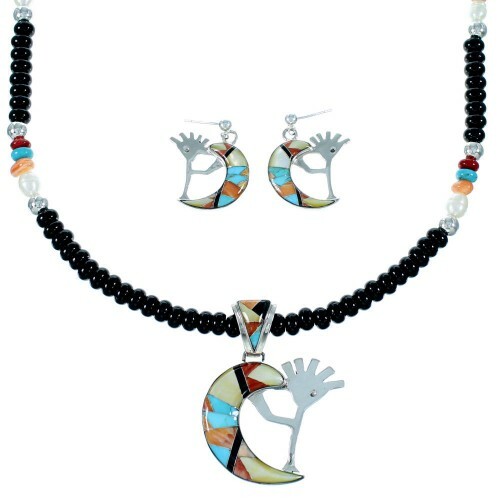 The inlay in this pendant and pair of earrings is individually made and inlayed using stones which are hand cut and carefully set into place creating these absolutely incredible pieces. 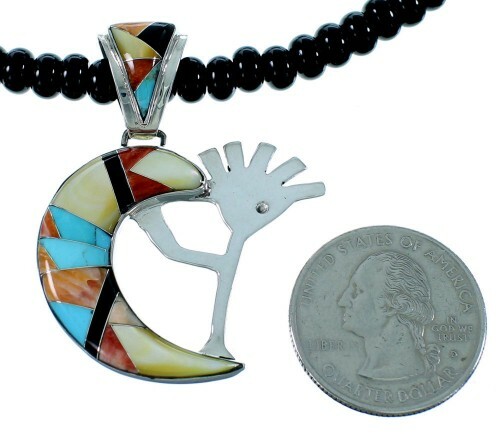 This stone inlay consists of: real Turquoise, Onyx, Yellow Mother Of Pearl, along with Red and Orange Oyster Shell. The workmanship and detail are spectacular! 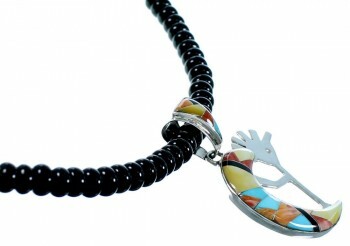 The inlay is carefully set forming a marvelous Kokopelli design, while thin silver lines highlight in between for a gorgeous look. The Kokopelli is a common fertility symbol throughout the Southwest. In some beliefs the Kokopelli visits various communities, seducing and impregnating the young women drawn to the tones of his flute playing. The pendant and earrings are stamped sterling and hallmarked. The necklace is handstrung out of genuine sterling silver and real Multicolor beads. 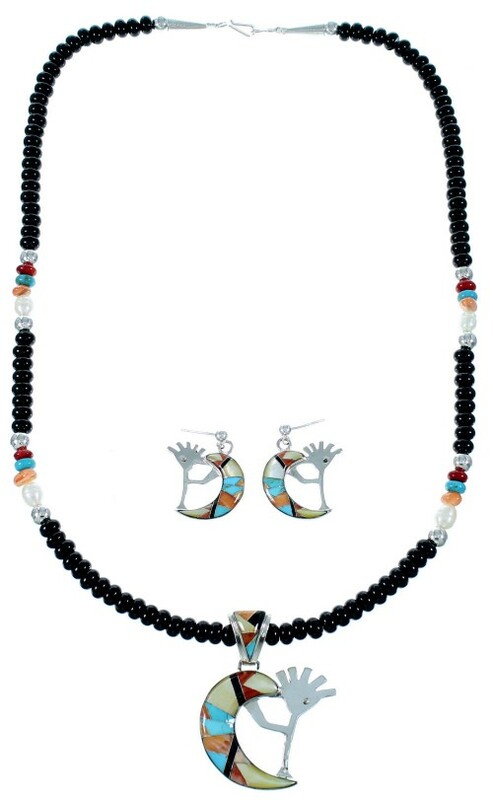 The necklace consists of: 6-mm Onyx, Turquoise, Coral rondelle beads, 6-mm fresh water Pearls, 6-mm Oyster Shell beads, and 6-mm Silver round beads. Each end of the necklace is completed with a silver cone for a beautiful look. The cones are stamped sterling.